The long awaited "Van Helsing" movie comes out this weekend. Horror.com's Staci Wilson was at the premiere, talked to the stars, and saw the movie. What did the stars have to say? What did Staci think of the film? Click below to find out! Click The Image Above To View The Van Helsing Premiere Video. 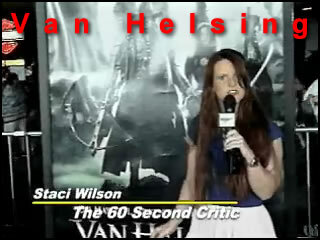 Click The Image Above To View the Van Helsing Review Clip. See the exclusive premiere photo gallery ! Read Horror.com's exclusive review of Van Helsing . Don't forget to check out the exclusive Horror.com Van Helsing interviews !